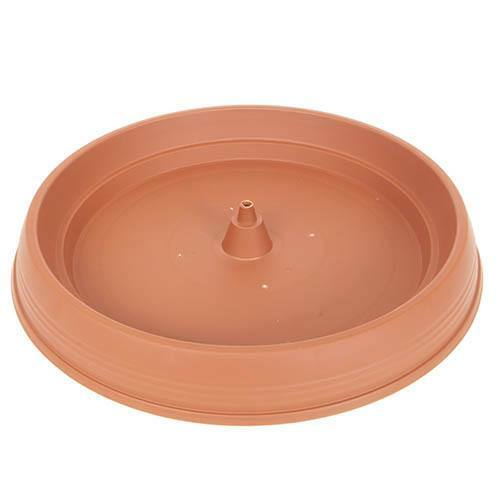 Ideal for use with our Growin-Pod vertical growing tower, in matching terracotta colour and manufactured from the same strong UV stable plastic. Can also be used for keep patios, conservatories or other indoor areas clean from soil and water. It is designed to hold the made up set of 4 in a layer snuggly and securely. Will catch up to 3 litres of water which can act as a water reservoir for the bottom layer if you are away on holiday, keepin plants watered. Supplied as one water tray for Growin-Pods - Growin-Pods sold seperately. If you choose to use your wonderful Growin-Pods as a vertical growing tower, or if you just want to keep your patio or indoors clean, the specially made Growin Tray in matching terracota colour is the perfect solution. Manufactured from the same strong UV stable plastic, it is designed to hold the made up set of 4 in a layer snuggly and securely, and will catch up to 3 litres of water too, which can act as a reservoir for the bottom layer if you are popping away from home for a few days - cuts down watering and keeps plants watered. Supplied as a 'growin' water tray for your 'Growin-Pods'. Pods supplied seperately.